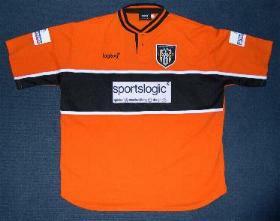 The home shirt was the basic black and white stripe but with none of the yellow that had been used as border on many of the previous seasons home kit. Spa Aluminium's deal had finished and the new sponsors were Sportslogic. As with most of the more recent deals signed late on pre-season, the logo was ironed onto the shirt design rather than being built into it (as it had been with the previous two designs.) Another change was the new style Nationwide epaulettes. They became white instead of blue. The major difference between the replica shirts of this season and the player issue was the black box on the back for the number. The replica version had the stripe continuing all the way down. The away shirt of this season was orange and you certainly couldn't miss it! The epaulettes were the same as with the home shirt and again the sponsor was added onto the shirt rather than being 'built into the design. A black band across the front housed the logo. The aways did go on sale as replicas and there is only one difference between them and the genuine players issue. The epaulettes never went on sale in that season. Its worth watching out for the sleeve length as well. The players were offered a choice of long or short but the replicas were all short. If you have a long then, its a player issue.One other point worth noting about the replicas. Although most had the advertisers name attached as a patch, some had an embossed look - like the one below. This was only a minor change that varied depending on when you bought your shirt. With Jocky Scott in post and the front pair Stallard and Allsopp scoring freely all season, Notts finished a creditable eighth in the table. 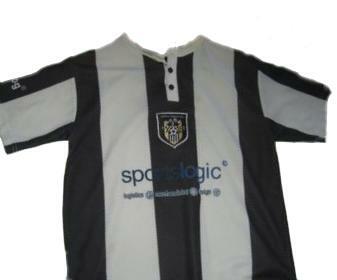 The home shirt with new epaulettes and sponsorship logo. The black box on the upper half of the back clearly identifies the design as exclusively player issue - in this case belonging to Anders Jacobsen, who discarded it because it got damaged around the collar. It was sold off by the club and became one of the few homes to be disposed of to fans in that season. The new-style league epaulettes were not sold in the shop during this season. Worth noting if you have one on your shirt. 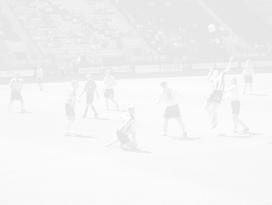 The third shirt for this season was plain white with the sponsorship logo ironed on. The shirt has a black collar and sleeves with a white line in the middle. The back of the shirt was blank as with the away one so the numbers could be seen clearly. 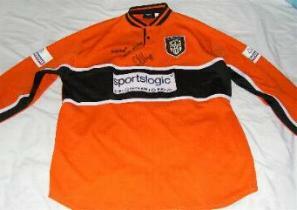 These were also sold as replicas with only the addition of epaulettes marking out a player-issue. As with the away shirt no long sleeved replicas were sold so if you have one, it will definately be player issue.Another distinquishing feature (albeit un-official) is a rip on the neck as some players apparently found them too restrictive. The away shirt for the season - the epaulettes attached show this one is definately player worn. ... likewise with this one. The long sleeves were not available to buy as replicas so this is definately player issue. The sponsors name is visible on the front of the shirt as well as the troublesome collar.Once again, the epaulettes betray the shirt as player worn.